Homeowners have a broad range of options when it comes to roofing materials. Factors like cost, durability, appearance, and longevity all have to be considered. One particular material that has always been a popular choice is cedar wood shakes. They can add a very pleasing natural and rustic look to any type of home from small lake cottages to very large extravagant houses. Cedar roofs are also very durable. According to studies, a cedar roof can last anywhere from 30 to 50 years if it is well taken care of. The maintenance for a cedar roof involves cleaning the wood to remove gray wood fibers and contaminants such as mold, mildew, algae, and moss. A cedar roof wood stain can then be applied to provide weather protection. 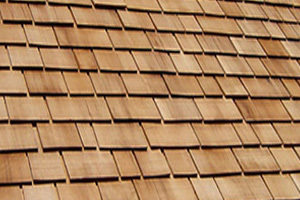 The type of cedar roof wood stain that you use is important. Besides color and opacity choices, the wood stain should have a formula that will best benefit the wood shakes. Cedar wood roofs are subjected to harmful UV rays probably more than any other wood surface around your home. This means that the cedar has been robbed of its natural oils and is extremely dry. It is best to choose a wood stain that replenishes the lost oils and conditions the wood. The best cedar roof wood stain should have nondrying conditioning oils that separate from the drying side of the stain. These conditioning oils penetrate into the wood to replace the lost natural oils. The restored oils rejuvenate the cedar while the drying oils stay near the surface to help lock in the conditioning oils and provide a layer of protection. A good example of this stain type would be Armstrong Clark Wood Stains. These wood conditioning cedar roof stains come in many transparent, semi-transparent, and semi-solid colors. They will add curb appeal to your home by enhancing the wood's natural beauty. The wood conditioning effect of these stains will help restore overly dry cedar roofs and give lasting results. A cedar roof can definitely add value to any home and taking care of it will guarantee a longer lifespan.